I would have never expected french onion soup to be one of my favorite soups, but it definitely is. I never had french onion soup as a kid and only tried it maybe once or twice in restaurants as an adult before deciding to make it myself. I followed a Tyler Florence recipe aptly named Ultimate French Onion Soup and promptly fell in love. I believe in that blog post I mentioned wanting to either go swimming in the broth or take a bath in it. If that isn’t a sign of truly loving a dish, I don’t know what is. I found this appetizer recipe on Pinterest and had it saved for a really long time before finally deciding to make it for my family on Christmas. 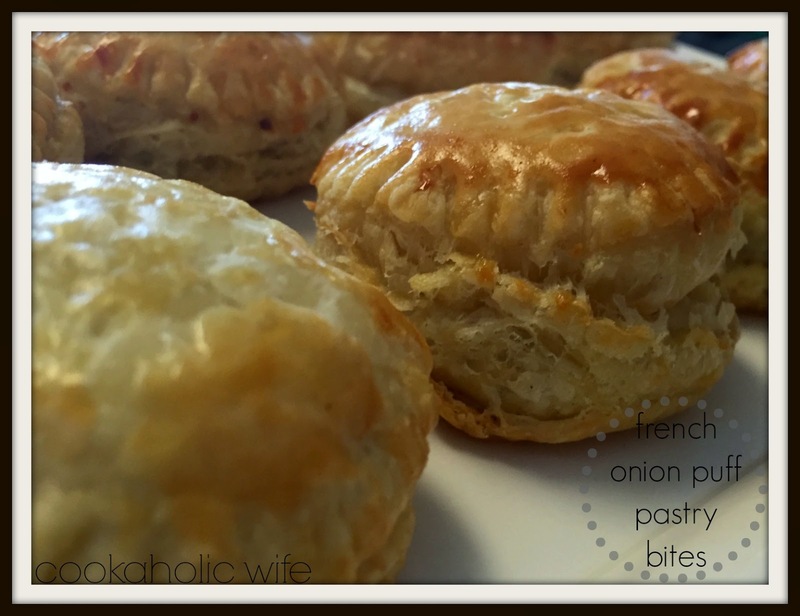 The recipe is a little time consuming (but you’d already know that had you made french onion soup before) but these can be made in advance and frozen, which I highly suggest doing. 1. Add the butter and olive oil to a medium saucepan over medium heat. Once melted, add the onions and stir to coat. Allow onions to cook without stirring for 4 minutes. Reduce the heat to low. 2. Add the sea salt, thyme and pepper. Stir in and cover. Cook for 4 more minutes, then stir again. Continue to cook and stir in 5 minute intervals, reducing the heat if the onions brown to quickly. In 25-30 minutes total, the onions will have cooked down to an almost jam-like consistency. 3. Increase the heat to medium and add beef broth to the pan. Use a wooden spoon to scrape up any browned bits. Cook on low until the liquid has evaporated, about 1 minute then set aside. 4. Preheat the oven to 375 and line a large baking sheet with parchment paper. 5. 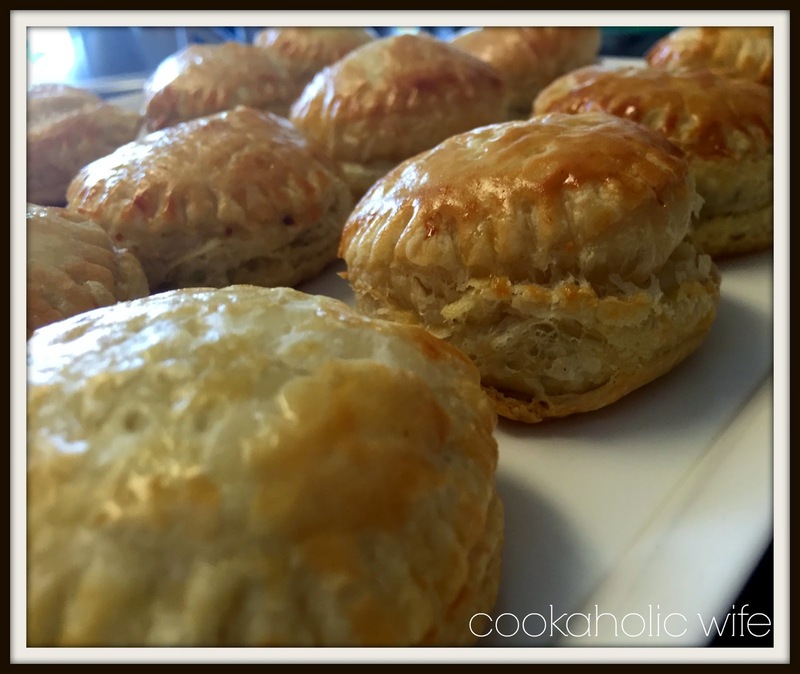 Roll out the puff pastry to 1/2-inch thickness. Use a 1 1/2 inch round cookie cutter to cut out 12 circles from one sheet of pastry. Cut out 12 more circles from the other sheet of pastry. Poke each pastry round 3-4 times with a fork. 6. Brush each puff pastry round with a beaten egg. 7. Top 12 of the pastry rounds with a small smear of the whole grain mustard. Put 1 teaspoon of the caramelized onions on top of the mustard. Put 1/2 teaspoon of shredded Gruyere cheese on top of the mushrooms. 8. Take the remaining 12 pastry rounds and flip over so they are egg-brushed side down on top of the mushroom/cheese topped pastry rounds. Press closed with your fingers, then use a fork to seal. Prick the top of each 4-5 times with a fork. 9. Brush the tops of the puff pastry with the remaining beaten egg then place on the prepared baking sheet. 10. Bake for 12-15 minutes or until lightly golden brown. Allow to cool slightly before serving. *To freeze: follow directions through step 9 then put pastries into the freezer on the baking sheet for 1 hour. Once firm, transfer to a sealable bag. To cook, place frozen pastries on a parchment lined baking sheet and bake for 18-22 minutes. Personally, I think you should keep at least 12 of these in your freezer at all times, especially around the holidays. Then if you ever have any guests drop by unexpectedly or you’re just hungry for some snacks, you can have these ready in 20-ish minutes, plus the time it takes for your oven to preheat. I wasn’t positive my family would like these but they devoured them. I didn’t even have any left over to reheat the next day to get a better picture!